Ganesha Chaturthi (also known as Vināyaka Chaturthi, Gaṇēśa Chaturthī or Vināyaka Chaviti) is the Hindu festival celebrated in honour of the elephant-headed god, Ganesha. This is a very auspicious day celebrated to pray to the god so that every new activity that is started is successfully completed without any obstacles (Vighna = Obstacle). Chaturthi (Hindi चतुर्थी) means "fourth day" or "fourth state". Celebrations are traditionally held on the fourth day of the second fortnight (Shukla Chaturthi) in every month and is also know as "Vinayaka Chathurti", but the biggest annual celebration in the month of Bhaadrapada in the Hindu calendar, usually is August or September in the Gregorian calendar. Badrapad corresponds to Virgo (simha/avani-tamil) in solar calendar. The festival generally lasts ten days, ending on the fourteenth day of the fortnight (Anant Chaturdashi). 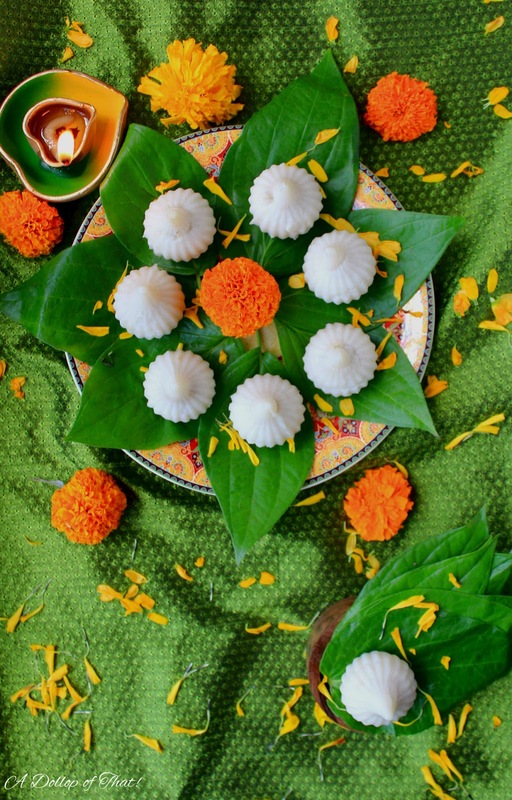 As with all festivals, hymns are sung, prayers are recited and prasad (offerings in the form of food made to the Lord.) is made. Legend has it that Modaks are Lord Ganesha's favourite sweet and are thus made by devotees to offer to him as prasad, traditionally Maharashtrian households prepare these modaks by making a rice flour paste and then filling it with freshly scraped coconuta jaggery, however contemporary modaks are made from chocolate, khoya (evaporated milk solids) or even filled with chocolate or gulkand (rose petal jam). Sweet shops accross the length and breadth of the country are flooded with modaks of every size, flavour and colour, but the traditional steamed ones are hard to find at retail shops, they are best had off your friends, mums kitchen. This year, as I saw my social media feeds flooded with these steamed dumplings in honour of the Lord, I decided to make a batch myself so I promptly called my better half and asked him to get me a modak mould (sold in shops close to his place of work). Mould in hand, nothing could now keep me and my almost unused package of rice flour from making these soft dumplings. I must admit here that making the outer covering needs some practice, adding too much will give a chewy almost rubbery exterior and using too little will cause the filling to ooze out. That said, don't let the fear of a little failure keep you from trying this age old recipe. 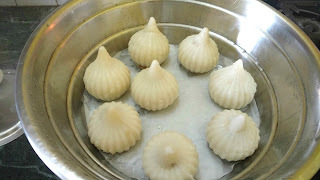 Though I have used a Modak mould (easily available at any grocery or utensil shop in India) you don't need compulsorily one. A little practice and you can easily make them by hand as the dough is filled, pulled, twisted and shaped exactly like one would a momo. In a pan dry roast the poppy seeds and sesame seeds, remove into a bowl and set it aside. 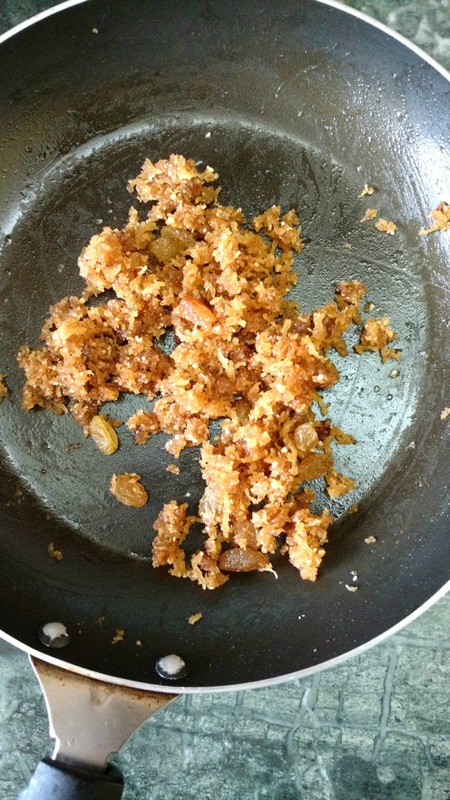 In the same pan now add jaggery with a tsp of ghee so that it melts well and doesn't stick to the pan. Once the jaggery melts, add in the fresh grated coconut. Next in, add the roasted poppy seeds and roasted sesame seeds. 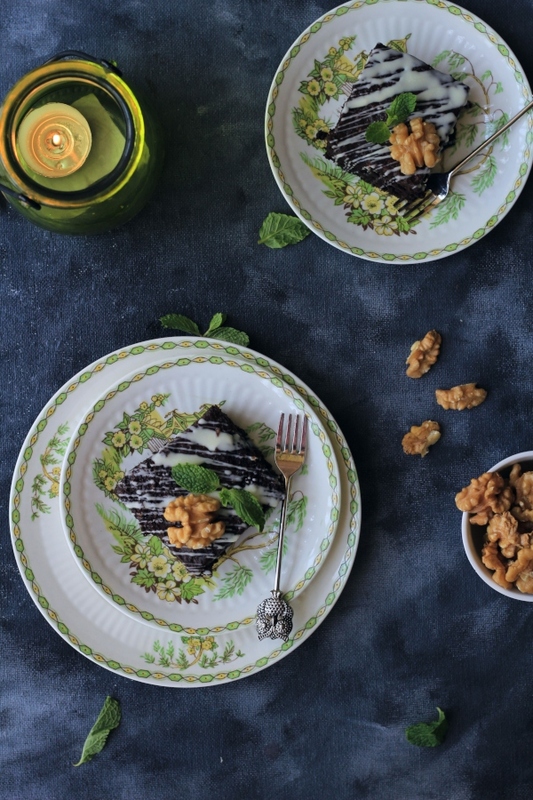 Top it with the nuts and cardamom powder. Combine well and the stuffing is ready. In a deep pan bring the water to a boil. Add a tsp of ghee, and a pinch of salt and sugar each to the water. Next, add the rice flour to the mixture and mix well. Cook for 2 min, then switch off the flame and cover it with a lid for 5 mins. To form the dough, bring down the rice flour mix onto a surface and start forming a dough by slowing adding a little ghee whenever needed. Once smooth, its ready to shape the modaks. Grease the modak mould with ghee, stuff in the dough, form the shape, fill the stuffing and close. Steam for 15- 20 mins on a medium flame. Pour in some melted ghee onto the steaming hot modaks and they are ready to be served. Modaks are my favourite. They look absolutely delish. Beautiful captures.